The acclaimed Esmeralda Enrique Spanish Dance Company (EESDC) proudly presents the world premiere of De Idas y Vueltas featuring new choreography by Javier Latorre, recipient of three Spanish national dance awards, Artistic Director Esmeralda Enrique and El Junco, returning guest artist from Spain who earned a Dora nomination for Outstanding Performance for his appearance in EESDC’s Portales last season. De Idas y Vueltas is an evening of dazzling flamenco dance and music that celebrates the Latin American songs that have been integrated into flamenco. It runs April 24-27 as part of Harbourfront Centre’s NextStepsdance seriesat Fleck Dance Theatre, a fitting wrap for Hispanic Heritage Month. De Idas y Vueltas uses the transmigrations of Spaniards to the Americas to explore how things come and go in all of our lives; sometimes returning forever altered and other times, never returning at all. The three inseparable ingredients in a flamenco performance are music, song and dance. For De Idas y Vueltas, Enrique brings together a brilliant combination of flamencos from Spain and Canada with spectacular results. The exceptional Javier Latorre (awarded Concurso Nacional de Arte Flamenco for choreography and former soloist with the National Ballet of Spain under the direction of Antonio Gades) brings his dynamic artistry in a lush and vivid choreography to open the evening. El Junco (Juan José Jaén Arroyo) of Cádiz, who was a soloist with Compañía Christiana Hoyos, returns for his second season as a featured guest dancer and choreographer. His vibrant and virtuosic prowess highlights the earthy essence of flamenco for a scorching chemistry with the talented EESDC ensemble of dancers: Pamela Briz, Paloma Cortés, Ilse Gudiño, Noelia La Morocha and Esmeralda Enrique herself. Óscar Lago (Cádiz) joins the company for the fifth time as lead guitarist and is music director for this production. Along with with long-time EESDC guitarist Nicolás Hernández, Lago was nominated for Dora Awards for Outstanding Sound Design/Composition for Portales (2013) andAguas/Waters (2012). Toronto guitarist Benjamin Barrile, who has been playing with EESDC for numerous recent engagements, will be the second guitarist. EESDC is equally honoured to again welcome singer Manuel Soto (of Jerez) who returns for his fourth season, joined this year by Matías López (of Barcelona), a fresh new Spanish vocal talent. Adding the remaining flavour to the music are returnees Chris Church (violin) and Rosendo “Chendy” León (percussion). Together, they express the depth of emotions portrayed in flamenco song with their intuitive, nuanced rhythms. Flamenco, an art form like no other, speaks to the heart and touches the soul. EESDC’s talented company of musicians, singers and commanding dancers deliver the power of this expressive art with elegance and passion; never failing to mesmerize audiences, eliciting shouts of “ole” and standing ovations at each performance. The award-winning Esmeralda Enrique Spanish Dance Company was founded in 1982 under the artistic direction of Esmeralda Enrique. Rooted in flamenco and Spanish classical dance, EESDC presents a style that holds both a classic and contemporary aesthetic in perfect balance while maintaining the values of traditional flamenco singing, dance and music. 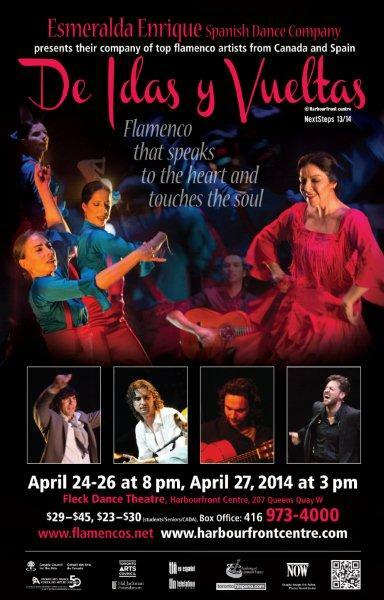 The Esmeralda Enrique Spanish Dance Company has been presenting an annual Toronto season since 1990. It has developed an ever-expanding repertoire that has earned both critical and popular acclaim. With unique, talented dancers and musicians from Canada and regular guest artists from Spain, the Esmeralda Enrique Spanish Dance Company is recognized for the exceptional level of its productions, receiving two Dora Mavor Moore Awards in addition to numerous nominations over the years (14 and counting). Esmeralda Enrique is one of the most celebrated flamenco dance artists in Canada; she reveals in her work a total mastery and love of this unique art form. EESDC enthralls audiences with its imaginative choreography and artistic excellence while bringing to life the contagious excitement and full breadth of feeling that this passionate art delivers. Harbourfront Centre’s Fleck Theatre, 207 Queens Quay West, 3rd floor.